Average Electricity Bill: Compare your Bill and Save Money Today! How Much is the Average Electricity Bill in Australia? Are you paying more than you need to for your electricity? Throughout Australia, homeowners are feeling the pinch of rising electricity prices that are increasing the average electricity bill dramatically. In just the 6 months between July 2017 and January 2018, the annual residential electricity bills for average consumers increased between $110 and $316. Small businesses saw an increase of up to 28%. 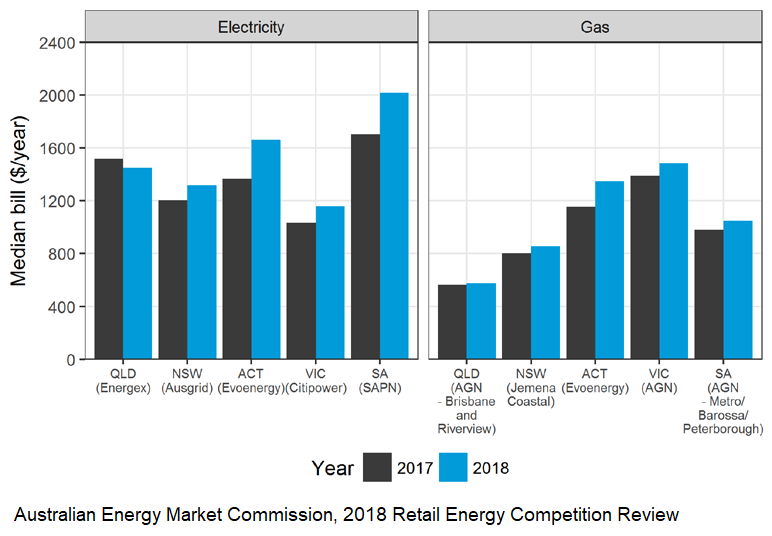 The Australian Energy Market Commission’s (AEMC) 2018 National retail energy competition review confirmed what we all know – consumer confidence with the information they are receiving about the electricity market fell to 50%. Rising prices and lack of transparency in the market has meant that people don’t feel confident in their ability to find the best electricity retailer in their area. Thankfully, Electricity Wizard can help to make sure you have all the information you need to compare and save on your power bills. With new regulations to ensure increased competition in the electricity and gas markets, customers have the chance to make huge savings on their yearly bills. Homeowners all over Australia can take one step in the right direction by comparing electricity rates with a reliable service like Electricity Wizard to help them find some of the cheaper rates available in their area. This comparison alone could be enough to help you save substantially each year on your average electricity bill, despite rising prices in the years to come. If you’re feeling like you’re stuck in your current contract, and that you’re paying too on your power bill, it’s time to shop around. According to the AEMC, 48% of Queenslanders and 35% of NSW residents are getting no discount at all from their energy retailer! They’re paying full price even though a quick phone call to Electricity Wizard would ensure an immediate discount on their electricity rates. With the continuing changes in the electricity market you’ve now got more power than ever to switch electricity retailers. You’re now able to look around, compare prices, and save. With so many retailers out there now we’re spoiled for choice, and it’s often hard to know who or what to choose. Average households need to know who is the best electricity company in their area. For people looking to save on their residential power bills, it’s important to know who is the cheapest electricity retailer and how much others are paying for their power. Cheap rates vary from state to state. The average yearly bill in NSW and Victoria is lower than the average bill in South Australia. The average household power bill for NSW, VIC and QLD is around $1,500 to $1,700 a year. SA customers who haven’t shopped around have been hit with a huge increase. The average electricity bill in South Australia is set to be $2,300 in 2018. Average daily electricity usage varies, so it’s easier to compare your own daily usage and available rates to see how much you can really save. Think of it this way – comparing prices for a new electricity plan is just like shopping around for anything else—work out what’s important to you, and see which company balances quality service with the best price. Which rate? – It’s obvious, but start by looking at electricity usage rates first. Make sure you’ve got your current average bill on hand so you know roughly what you use, and can do the maths to work out if the supplier really is cheaper or not. Don’t be afraid to match rates – This works with energy suppliers too. Ask the supplier if they can match or even beat rates set by other suppliers. With the amount of competition in the energy market today, companies are willing to match prices to keep you on board, thereby allowing you to get a better deal from the supplier you want to go with. Choose the right plan for your household – Energy plans are changing. Check with your supplier to see if they’re offering you a fixed rate or a variable rate plan. Most retailers work on feature variable rates, meaning the price they charge you can change. These days, some retailers are introducing fixed rate plans, where your energy usage rate fee is locked in at a certain price for a defined time period. Depending on how much electricity you use, this can work in your favour, and you’ll avoid any changes to your bill. But, as with everything, be sure to read the terms and conditions thoroughly first. Terms and conditions – Make sure you compare all relevant tariffs, caveats, and terms and conditions in the fine print from each supplier before deciding which to go with. Make absolutely sure you’re not jumping into a plan that you’ll regret in the future. Discounts – With the competition in the market today, many energy suppliers provide discount offers, so don’t be afraid to ask what’s on offer. But make sure you know what you’re getting into—check to be sure that any terms or conditions won’t come back and bite you later, and double check the length of the discount, as it might not cover the full term of your plan. Cheapest isn’t always a saving – While your goal is finding the cheapest rate, be cautious when you find deals that are too cheap. Retailers are businesses that want to make money, so with some cheap usage rates retailers might offset these rates with a higher supply fee, or vice versa. So when choosing a new retailer, it pays to look around and ask some questions, so you can get as much information as possible before diving into a new plan. And it’s not just homes. Businesses too can benefit from comparing prices and choosing a plan that helps you maximise your savings and boost your bottom line. You’ve Compared, Switched, and Saved – What Now? If you’ve just switched retailers, or you’re satisfied with your current plan, there are still many ways you can reduce your electricity use and save money on your power bill. After comparing your average electricity bill to find cheaper rates available near you, it’s still important to focus on energy conservation around the house to cut down on your electricity expenses even further. Keep your windows, blinds, and curtains closed during the long summer days. This not only stops the sun from getting into the house and keeping your house cooler, but also protects against sunburn. Open your curtains and windows up in the late afternoon to let in the cooler air. Also in summer, when you start to feel hot turn on the fan instead of the air conditioner. With a lower energy usage, this moves cool air around the room, and can save you up to $200 a year! If you do use your heater or air conditioner, keep the doors and windows of that room closed, so the air stays in the room. After all, it costs more to heat a whole house than it does just one room. Replacing any old incandescent lights with newer energy saving bulbs or LED lights can save up to $150 a year. Heating water uses energy too, so adjusting the temperature of your storage hot water system from 80°C to 60°C can save you up to $70 a year. Run your washing machine and dishwasher at night. While times may differ, most electricity retailers reduce usage rates during off-peak hours, so if you’re unsure give them a call and find out. Switch non-essential appliances off at the wall, such as the television, washing machine, dryer, microwave, kettle, and even your phone charger. Keeping them turned on, but in standby mode, still uses power, and can be a surprising money-drainer. Use only one refrigerator. If you have an old refrigerator in the garage, it is likely using up to two- to three-times more electricity than a newer, energy-efficient model. Getting rid of your second refrigerator could save you an estimated $200 per year on your average electricity bill. Dry clothes outside in warmer weather. If you have a clothesline in the backyard, it’s time to put it to use! If you use the sun to dry your laundry, it will cut down on the amount of time that you need to use your clothes dryer each week. Drying just four loads of laundry outdoors per week will reduce your average electricity bill by $150! Regulate your thermostat. In the summer, it’s best to keep your thermostat at 23°C to 26°C to save roughly $80 on your electricity bill. During winter, keep it between 18°C and 20°C. For every degree that you increase or decrease the temperature in your house, you will save 10% on the cost of electricity used for cooling or heating. Combining a comparison of electricity prices and conserving energy will almost certainly help you to manage expensive electricity bills that could be eating into your savings! If you find yourself living from paycheque to paycheque you should use these helpful tips to reduce your energy expenses so that you can stop wasting money on often outrageous utility costs. At this point, you’re probably mentally exhausted just thinking about it. Doing an electricity comparison isn’t easy, and many energy brokers don’t do it correctly. This is where Electricity Wizard comes in. We’ll do a comparison the right way, ensuring we cover all the critical elements when comparing energy providers. Our service is completely free! And we offer Exit Fee Protection when making the switch to a new provider. It’s never been easier to compare energy providers than with Electricity Wizard. Call now on 1300 359 779 and speak to an energy specialist who will help you find a deal to better meet your needs.